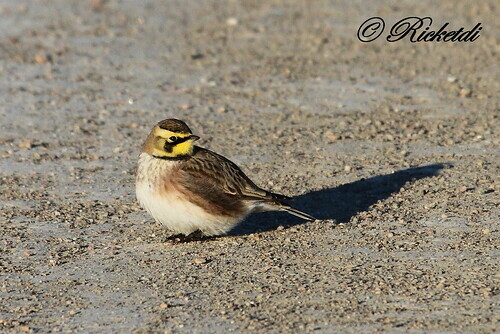 A male Horned Lark (Eremophila alpestris) sings from a clump of sod. Photographed at East Grand Forks, Minnesota (07 April 2013). 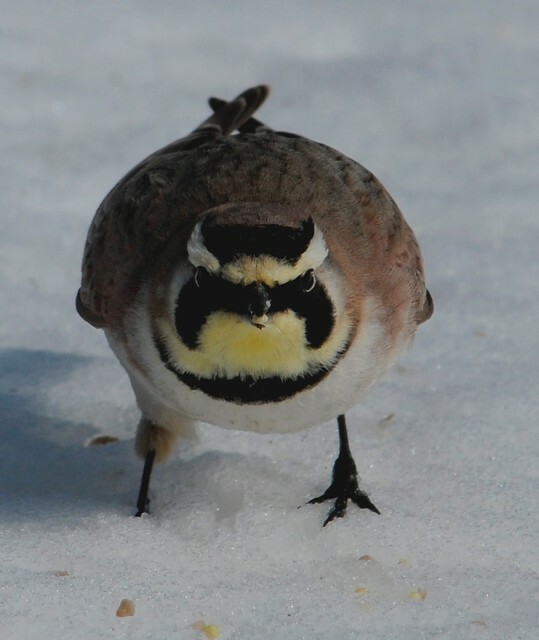 A video portrait of a singing Horned Lark, gathered just before sunset near Columbia, Missouri at the University's Bradford Farm Experimental Station. The male has a high-pitched tinkling song that cascades to a jumble at the end. At the end of the video, the male sings a more complex, extended song that goes on for nearly ten seconds before ending with the typical jumble. 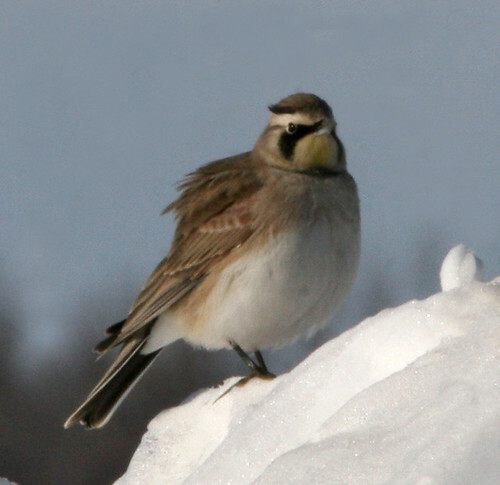 Unlike most other larks, this is a distinctive-looking species on the ground, mainly brown-grey above and pale below, with a striking black and yellow face pattern. Except for the central feathers, the tail is mostly black, contrasting with the paler body; this contrast is especially noticeable when the bird is in flight. The summer male has black "horns", which give this species its American name. America has a number of races distinguished by the face pattern and back colour of males, especially in summer. The southern European mountain race Eremophila alpestris penicillata is greyer above, and the yellow of the face pattern is replaced with white. (C) Copyright Ricky L.Jones Photography 1995-2015 All rights reserved. 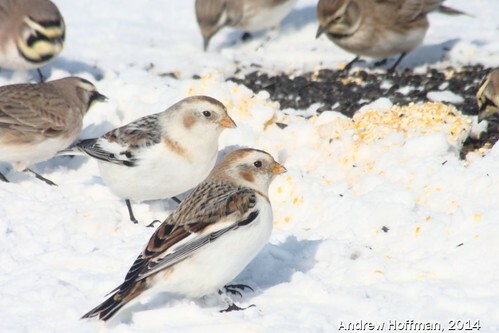 Several dozen Horned Lark and Snow Buntings were foraging around a large feedlot on Cameron Lake Road.